At Birthday Express, we’re about more than throwing birthday parties – we’re about creating amazing memories that last a lifetime. 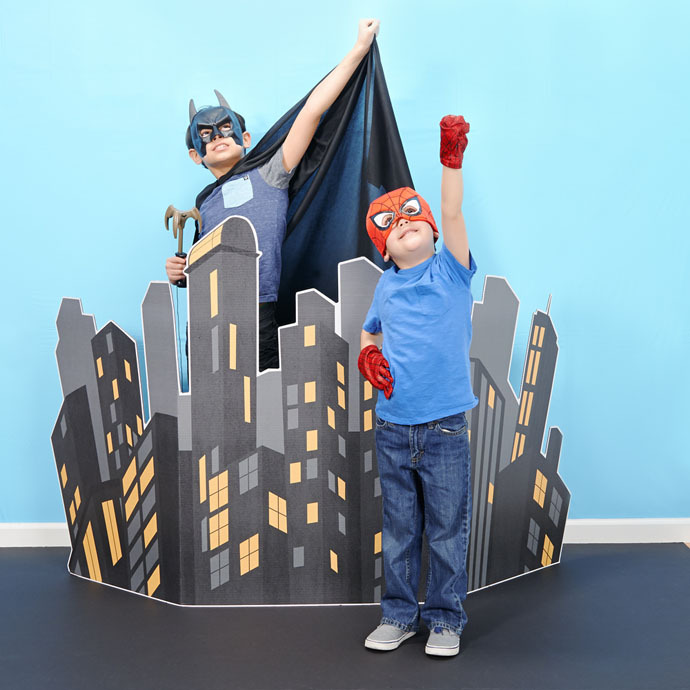 If you’re looking for a way to get the best birthday party photos ever, then these photo booth props will do just the trick! There’s everything from photo booth backdrops to props for posing, and every item has been curated by our team of party experts to coordinate perfectly with a different party theme. Basically, we’ve got everything covered except for the camera. So, get ready to snap some shots! 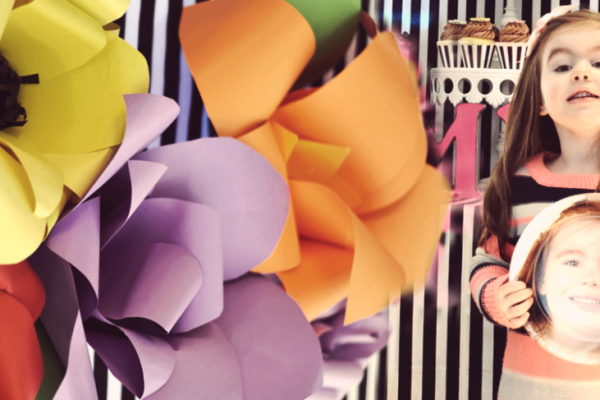 Here’s a quick guide on how you can use photo booth props to enhance your child’s birthday party. 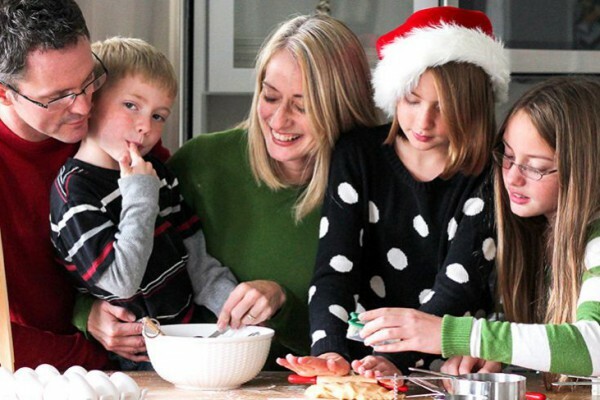 Click here to read our post about tips for taking family photos in general. The Diva Rocker theme is all about being pretty and pink, and a little bit punk, too. 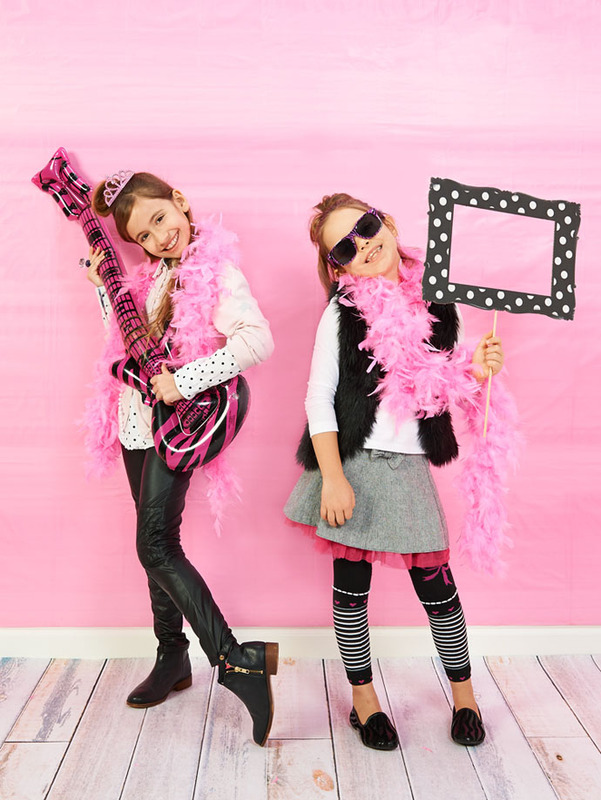 For those about to rock, this photo booth theme is sure to create a memorable birthday experience. These photo booth props are nothing but the absolute essentials for any rock star diva on the road: pink inflatable guitars, pink feather boas, and – of course – stylish sunglasses. Everything is 100% glam and gorgeous. 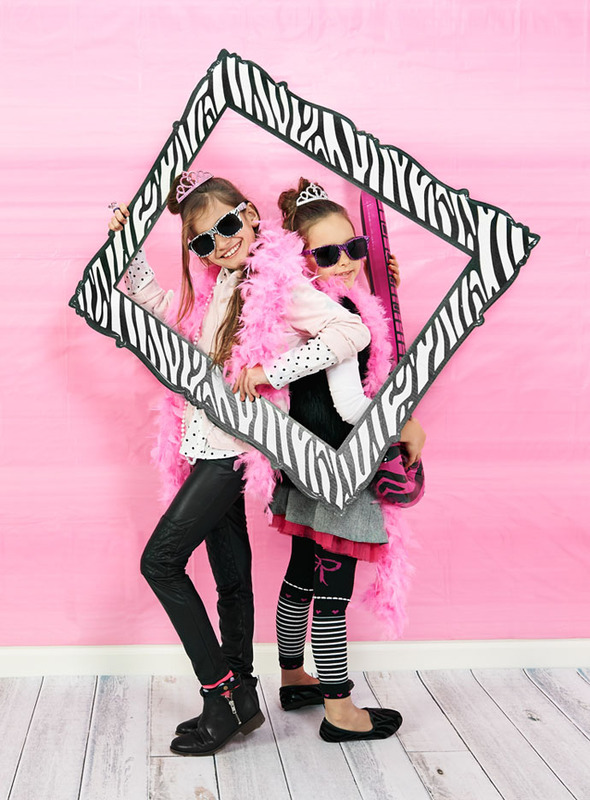 Animal print frames match the blow-up guitars and add even more photo op magic to this photo booth idea. As you play the part of parental paparazzi, just keep in mind that there’s no such thing as too much pink. This Paris party theme is all about everything that’s trendy, fun, and fashionable. 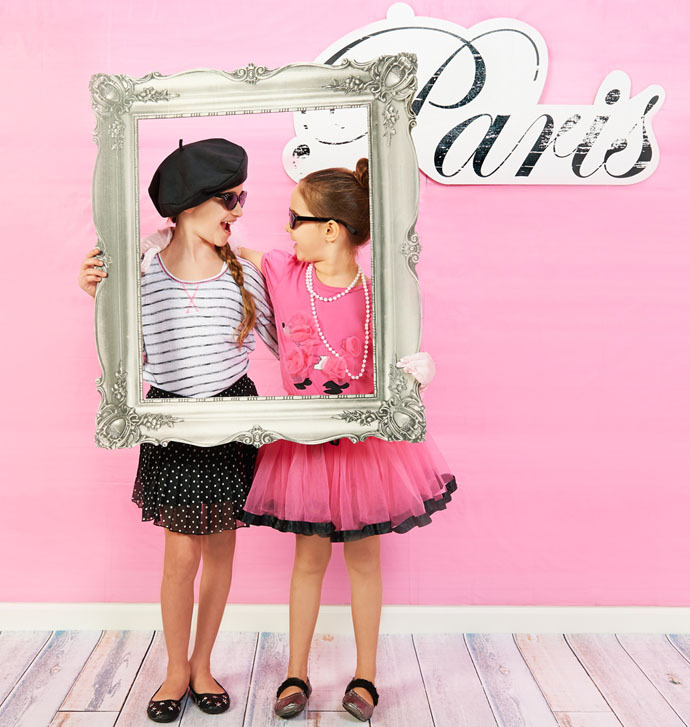 Have your daughter and her friends strike a pose with our Paris Damask photo booth kit! Get more Paris party ideas here. A simple pink backdrop forms the basis of this photobooth, but these antique-styled faux picture frames take it over the top. Not only are they perfect for posing, but they fit wonderfully with the rest of the Paris Damask party supplies. It wouldn’t be much of a Paris themed party without an Eiffel Tower, would it? This cardboard Eiffel Tower standup is a quite a bit smaller than the real thing, but that just makes it easier to set up. Pink princess gloves and pearls add more fun French flair to the whole setting. 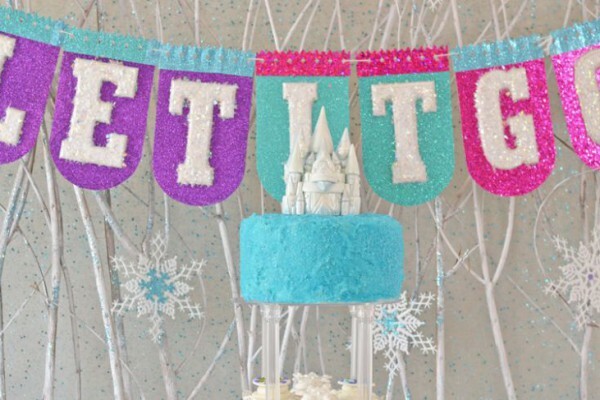 Every little girl deserves to be treated like royalty on her birthday, and this photo booth idea absolutely does the trick. 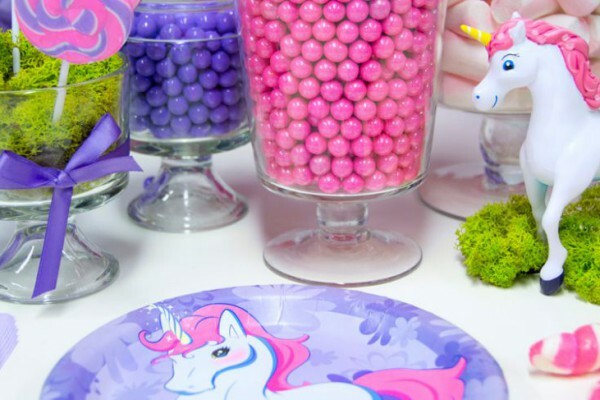 Click here to browse our complete collection of princess party supplies and birthday themes to get the perfect look for your daughter’s special day. 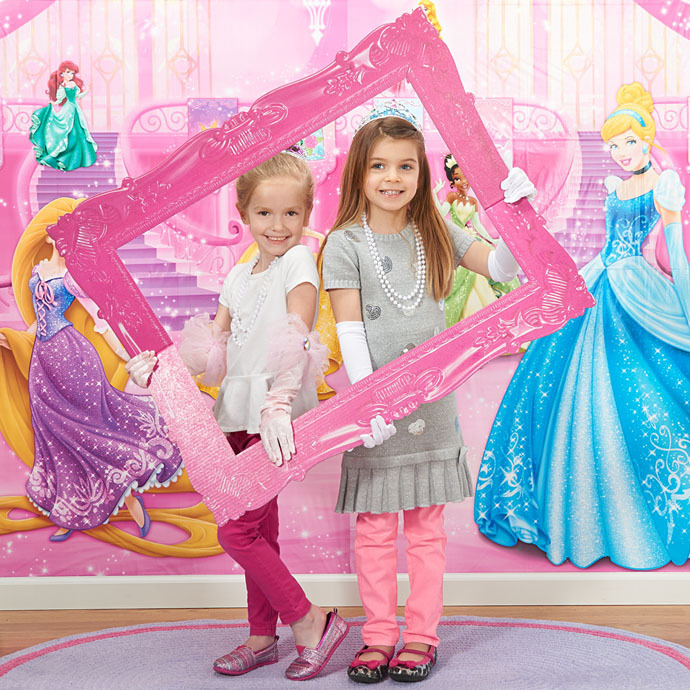 This princess party backdrop is a great way for guests to get involved the scene, and jumbo picture frames are excellent props to pose with as well. 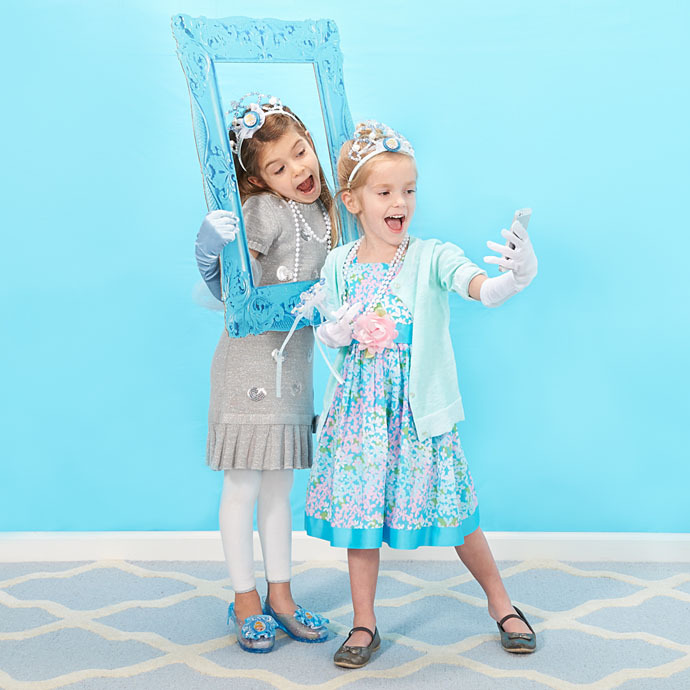 Princesses need a little extra luxury though, so use princess costumes, tiaras, and faux jewelry as photo booth props, too. This photobooth theme also comes with solid pink and blue backdrops to ensure that all princesses will be able to take the perfect photos. For example, pink matches nicely with Sleeping Beauty, but Princess Elsa will definitely look better against blue at her Frozen party, and Cinderella agrees. 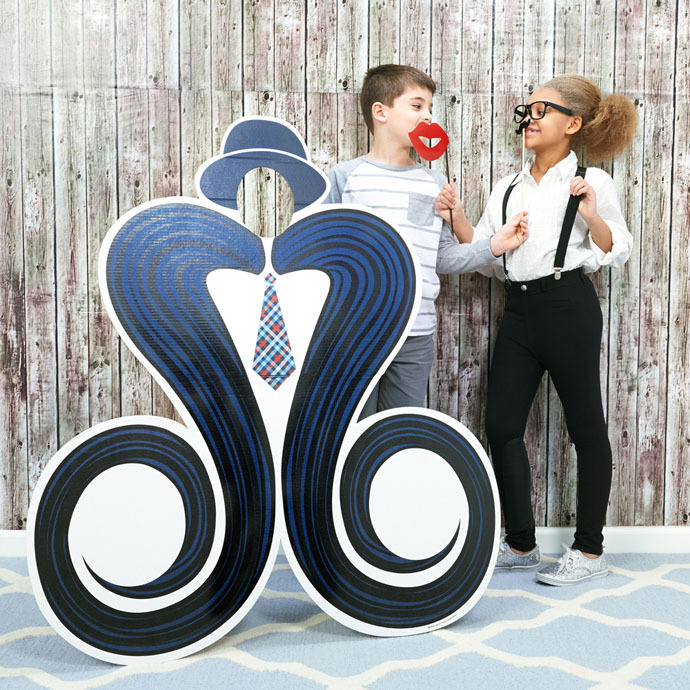 If you’re looking to build the ultimate birthday for your child, then building your own photo booth with these props can be a great way to enhance any construction birthday theme. Click here to view the rest of our construction party supplies, too. A faux wooden photo booth backdrop definitely helps to bring the look and feel of a real life construction site to the party, as do these road crew cutouts. 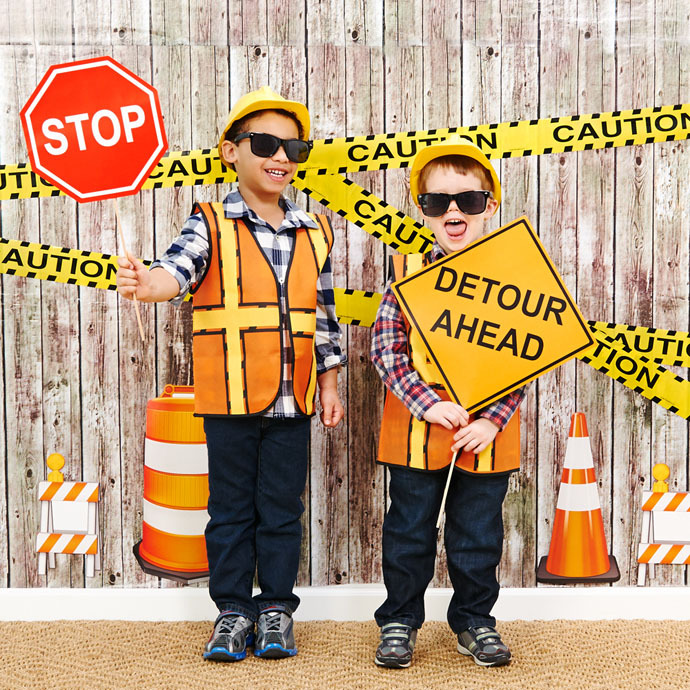 Hang up some caution tape and place realistic road signs around the party area to add the finishing touches. The kids will have fun posing with all of the different signs, too. 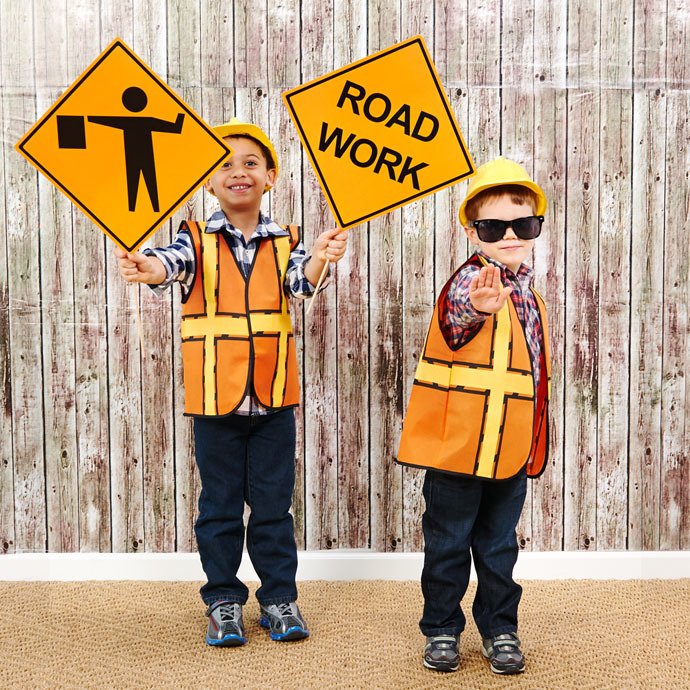 To really get them into the party theme though, let them dress-up with plastic hard hats and orange vests. Up, up and away! 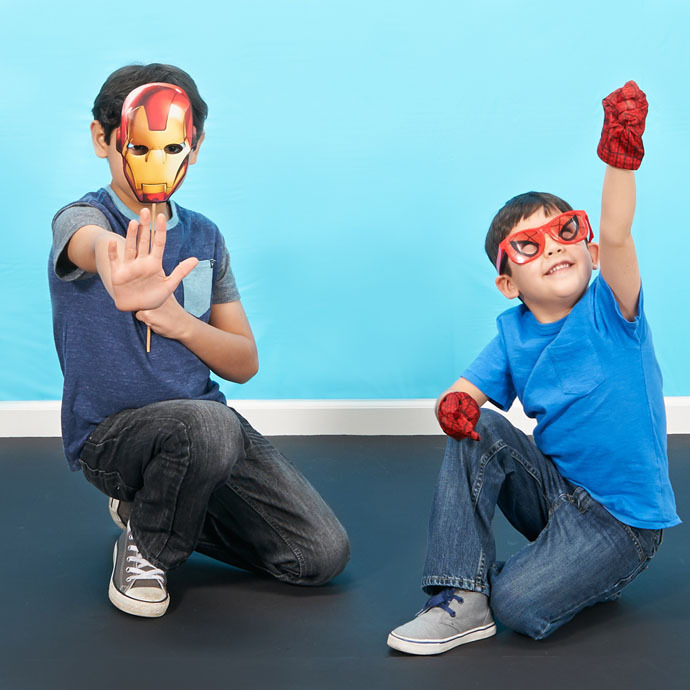 Superheroes and comic books are always great looks for a birthday party, so let all of the party guests take on their own super-secret identity with a superhero photo booth theme. What makes this photo booth really shine isn’t the blue sky backdrop, but the huge standup city in front of it! Any superhero will feel right at home while posing in front of this stylized skyline – it looks like it came right out of a comic book! As for the superheroes themselves, that’s where the costumes and props come into play. Avengers, Spider-Man, and Batman photo booth props come included with this package, but all kinds of superhero costumes work wonders. Superman and TMNT costumes are just two options that look fantastic with this theme. 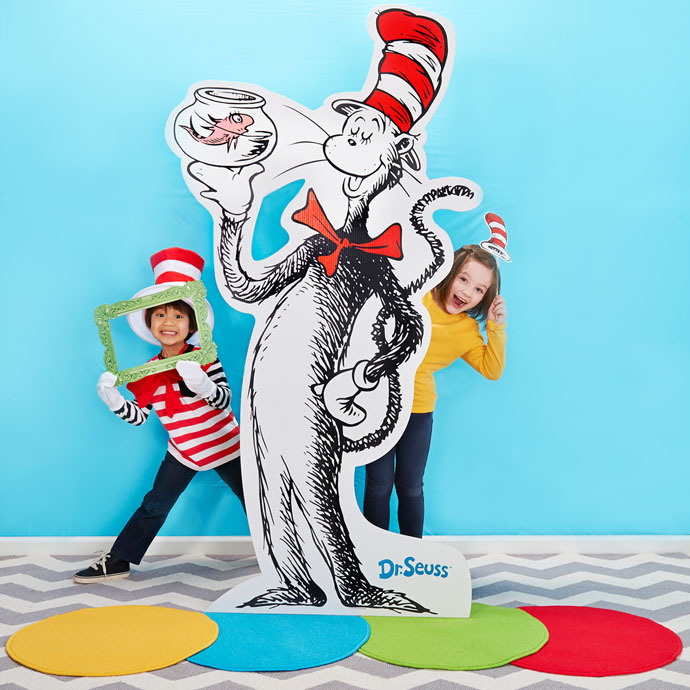 Just about everyone grew up with Dr. Seuss books, so this photo booth idea is great for kids and parents alike! 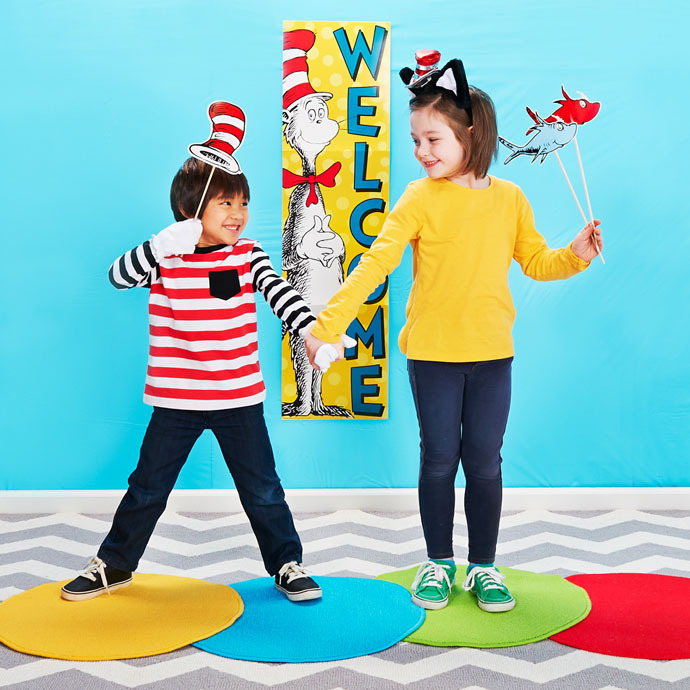 For even more Dr. Seuss birthday party ideas, check out this post to learn about our DIY Dr. Seuss decorating projects. Each one is super easy to make, and they will all make any Seuss party look amazing. No Dr. Seuss birthday party would be complete without the Cat in the Hat, and with this cardboard standup, it’s like the Cat is really there! From the tips of his toes to the top of his hat, he’s over six feet tall, which makes him the perfect posing partner for birthday photo-op fun. A giant blue backdrop and Dr. Seuss banner finish setting the stage. Of course, part of the fun of making your own photo booth is getting to look the part, and the Dr. Seuss theme is no exception. Adding ordinary wooden dowels (or pencils, in a pinch) to some One Fish, Two Fish fish cutouts creates easy DIY photo booth props, and Cat in the Hat hats are just about must-haves. His signature mitts and bowtie are also included in this kit, as is this cute cat ear headband. Everyone’s favorite classic cartoon characters are here to join the party! 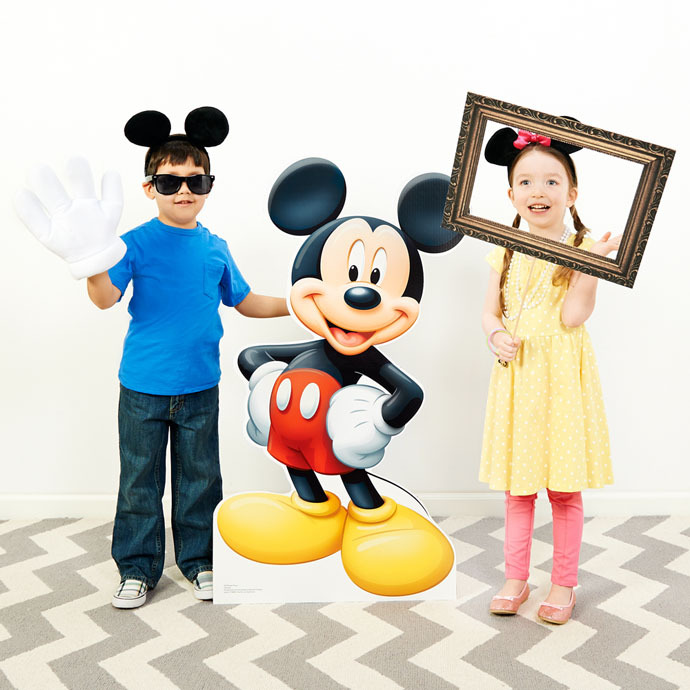 With these photo booth props, it’s like they’re really there, too, because these Mickey and Minnie cardboard standups are life-size! 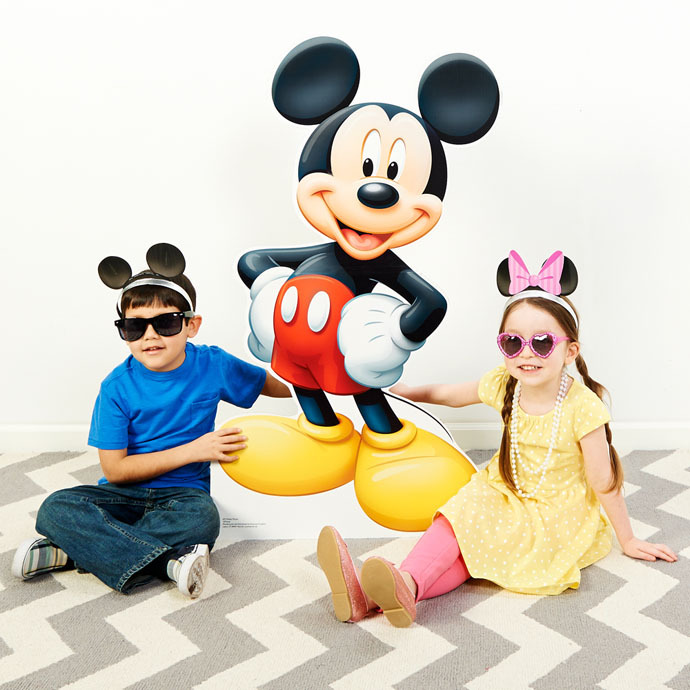 Click here to explore more Mickey Mouse and Minnie Mouse party supplies. Posing with Mickey and Minnie make for great photo ops, and adding these picture frames to the picture (literally) make everything even more fun. Backdrops are included with this photo booth, but the frames can let you get so creative even with just a blank wall. Minnie and Mickey Mouse costumes are must-haves for this theme, too! Mouse ears are the most famous accessory, but Minnie also needs some bows and a few pearls. Yar har, ahoy and avast! ‘Tis the time for a pirate birthday party, me hearties! 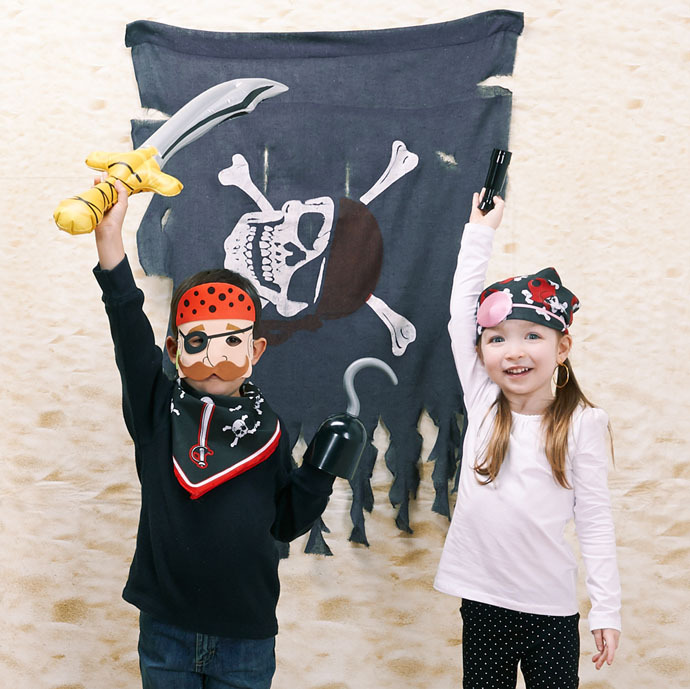 These photo booth props aren’t quite the same thing as buried treasure (birthday presents should be playing the part of treasure, anyways), but they’ll turn your child’s buccaneer bash into an amazing experience. 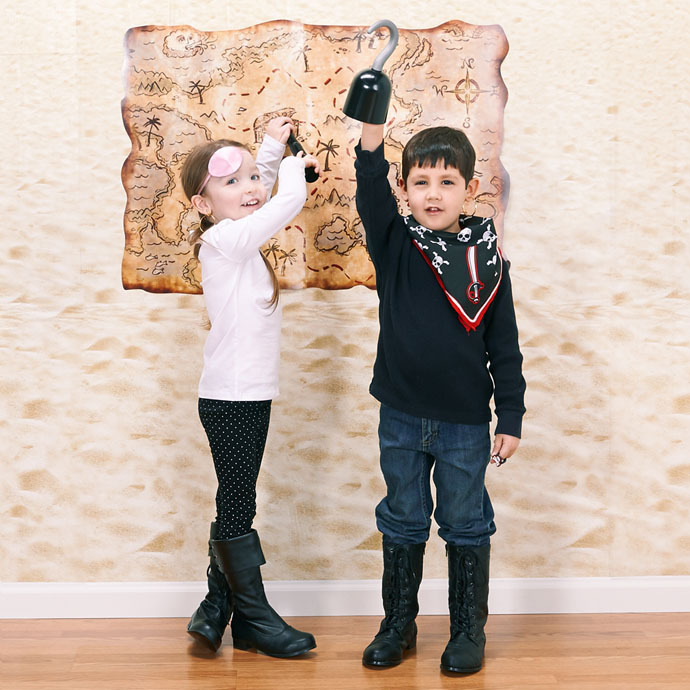 Check out our complete collection of pirate party supplies and party themes right here. 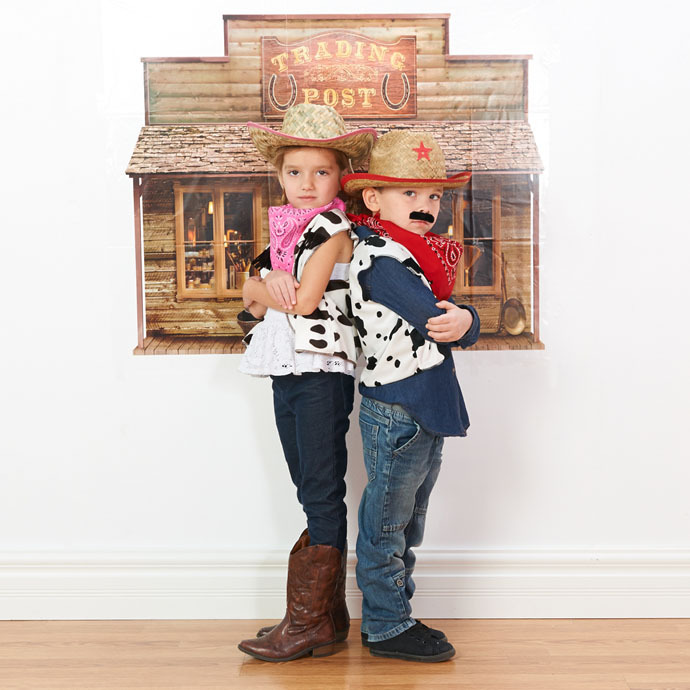 A sandy beach photo booth backdrop is the first step towards transforming your house into the perfect pirate scene. It’s huge enough to cover the whole wall, and has the added bonus of not getting sand everywhere. But, you’ll also need a few extra accessories. This treasure map can serve purely as a decoration, or your pirates can hold it in their hands as they search for the X that marks the spot. Here’s another pirate photo prop that puts the guests right in the middle of the scene, and a raggedy pirate flag is the perfect finishing touch. As for pirate costumes, there are a couple dress-up essentials that this photo booth set-up simply needs, like eye patches, gold earrings, pirate hooks, and bandanas. No true pirate captain is ever without his or her trusty telescope, either, and inflatable pirate swords are fun yet safe to play with. We also strongly encourage all pirates in attendance to talk like pirates as much as possible. Speaking of the seven seas, pirates aren’t the only ones out there in the ocean! 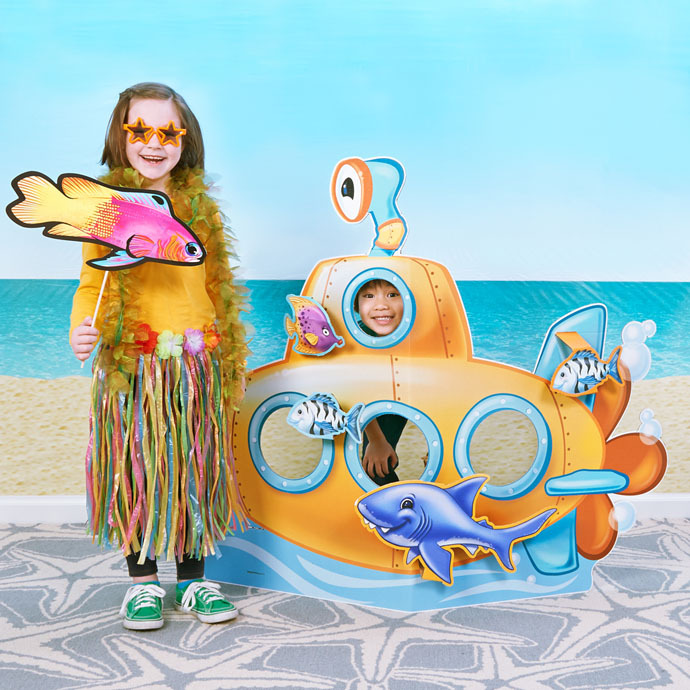 This sea life photo booth idea works great with a beach or luau themed birthday party, and it also pairs beautifully with themes like the Octonauts. Click here to more sea life decorations like this combining with our Octonauts party supplies. The photo op prop that stands out the most here is definitely this stand-up submarine. Kids can take a look through the portholes and become the pilot of their own underwater adventure! Accent it with cutout fish and a giant ocean backdrop to complete the scene. Back up on dry land, create a beach look with a couple of palm trees and perhaps a game of limbo. 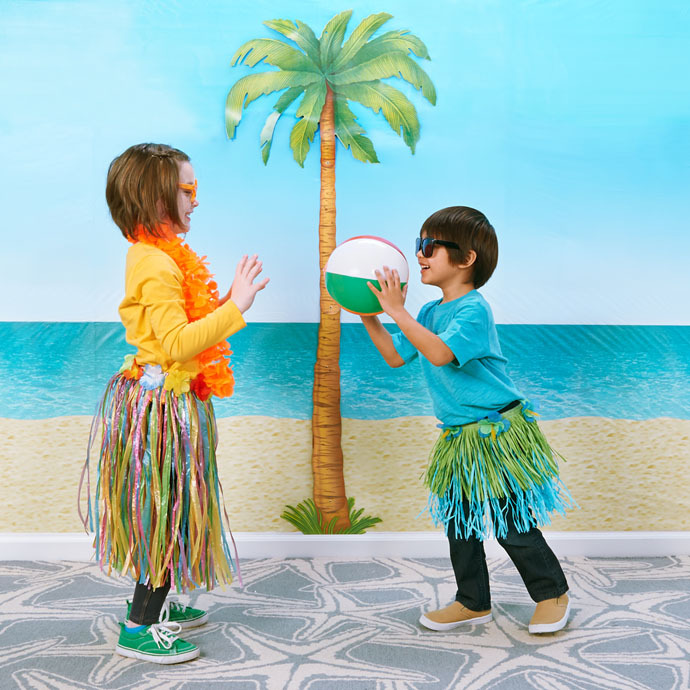 Classic beach balls are definitely posable props as well, and kids can dress up with seaweed boas, star sunglasses, flowery leis, and grass skirts. We mustache you a question: are you ready to party? 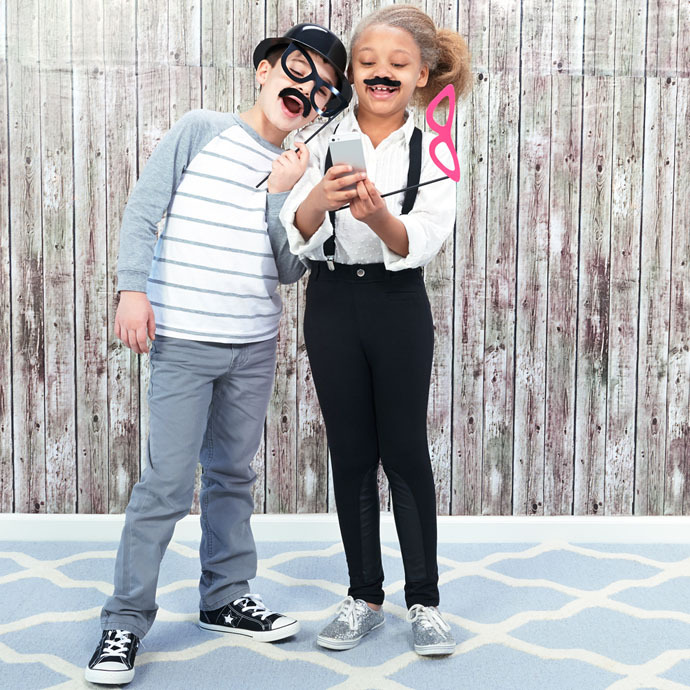 Mustache party supplies are huge hits with boys and girls alike, so we absolutely had to create a photo booth to match. Check out some of our other posts if you want to get more mustache party ideas, to learn more about our pink mustache party theme. We used this barn siding backdrop to create the setting for this photo booth theme – the wooden texture looks fantastic on its own, and also compliments the rest of the props. Get classy with plastic bowler hats, suspenders, nerdy glasses, and (of course), fake mustaches! This mustache stand-in is related to our Little Man Mustache theme, but it’s anything but little. When kids stand inside it, they’ll have a stylish stache that’s bigger than they are! Adhesive fake mustaches and elastic mustaches are a little more manageable, though every bit as fun. Step right up, step right up – ladies and gentlemen, boys and girls of all ages! 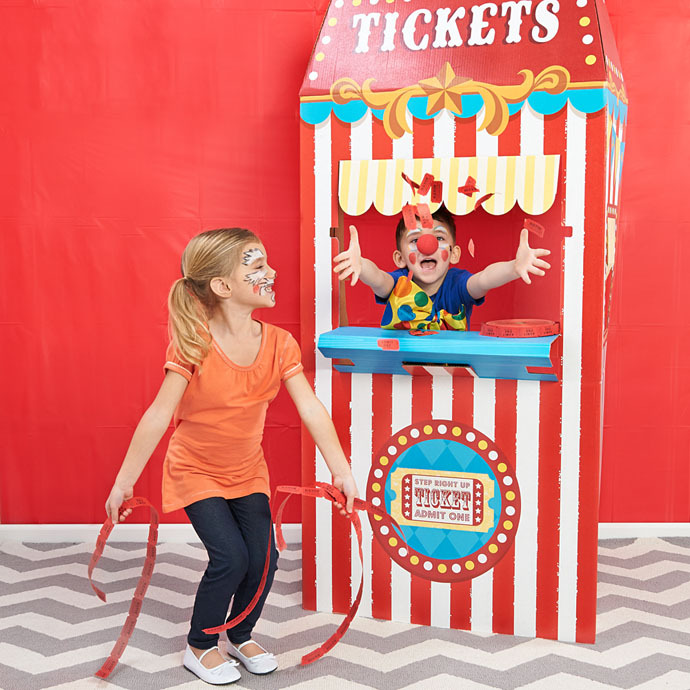 A circus or carnival party theme can really turn your child’s birthday into the greatest show on earth, and this photo booth setting has plenty of roles for the kids to play. The backdrop for this scene is just a simple red plastic tablecover … or is it the inside of a big, red circus tent? Let imaginations run wild! 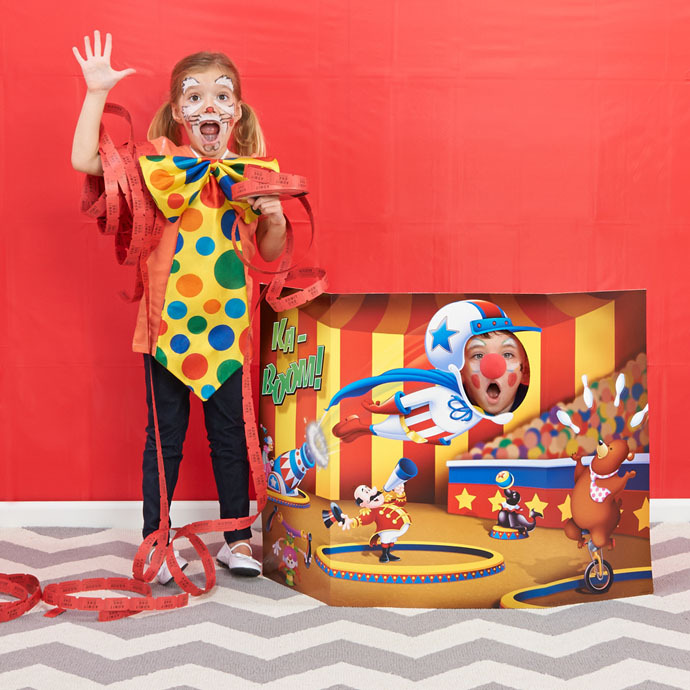 Children can pose with this circus photo prop that puts them right in the center of all the three-ring action. It’s also a lot safer than actually getting shot out of a cannon. This ticket booth is also tons of fun, and its three-dimensional design makes the entire party theme look totally authentic. Circus cutouts and cardboard circus signs add to the atmosphere even more, but this theme is really all about the dress up. With a big goofy tie and a red nose, each party guest can get their picture taken as a clown! Face paint sticks make it easy for everyone to become whatever character they want, too. Giddyup! Cowboys and cowgirls alike will fit right in with this western scene. The wild west has always been a favorite of little boys everywhere, but Pink Cowgirl party supplies are a top trend for girls, too! 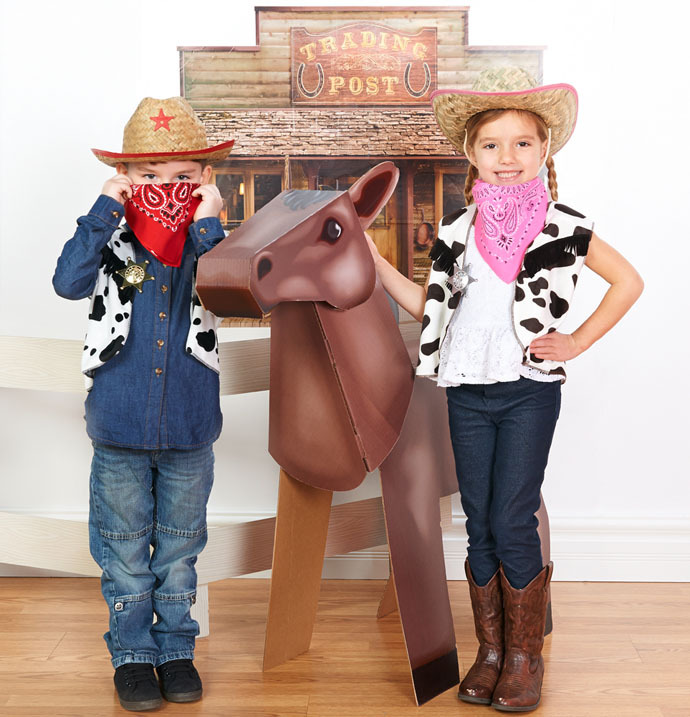 Check out that link for more cowgirl party ideas. These backdrop decals look just like set pieces from old-school western TV shows. There’s a trading post, a general store, and even a saloon – the kids will have to stick to root beer, though. Photo props that look like wanted posters and jail cells are just waiting for faces, and to really add some horsepower to the mix, what could be better than a horse? Getting a real horse inside might mess up your living room, unfortunately, so this cardboard horse prop will have to do. It’s super easy to assemble out of the box, and will really put your child’s birthday over the top. Cowgirl and cowboy costumes are where this theme really shines, though, because there are so many different ways to dress-up. Masks make for a fun way to play the part, but accessories look a lot more like the real thing. Party guests can try on and pose with different combinations of cowboy hats, bandanas, vests, and sheriff badges to get the ultimate old west photo op. What kind of photo booth ideas do you think we should come up with next? If you liked this post and want to see more like it, then let us know! Find us on Facebook and Twitter to share your thoughts, and check out our Pinterest boards for even more great birthday party ideas.